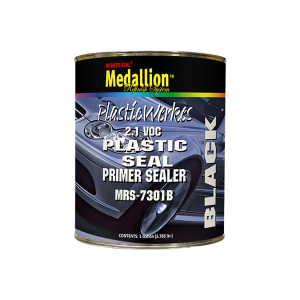 MRS-7301 Plastic Seal Primer Sealer is a 1K primer sealer specially formulated to adhere to clean, unsanded automotive plastics, especially polyolefin plastics (TPO, TEO and PP). It increases productivity by eliminating the sanding step for raw, unprimed plastic parts. Clean the surface with MRS-7300 Plastic Blast, apply MRS-7301 Plastic Seal Primer Sealer and apply topcoat after 60 minutes. It is V.O.C. compliant in all 50 states. Packaged in quarts and gallons.